The most advanced hair transplant method for hair loss. Follicular Unit Excision (FUE) is a cutting-edge hair transplant procedure that allows you to wear your hair long or incredibly short without the fear of showing a linear scar. 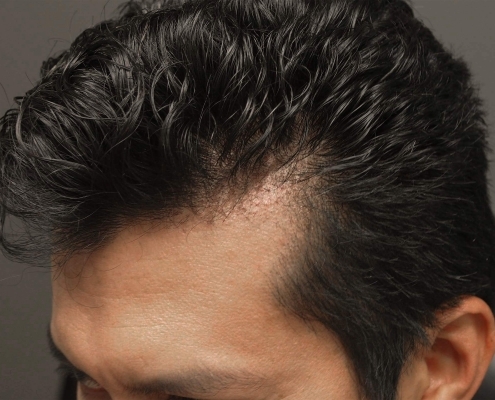 The FUE technique can be used for hair transplants, hairline lowering, eyebrow transplants, beard transplants, and scar revisions. Follicular Unit Excision (FUE) is a cutting-edge hair transplant harvesting technique that allows you to wear your hair very short without the fear of a large scar showing. 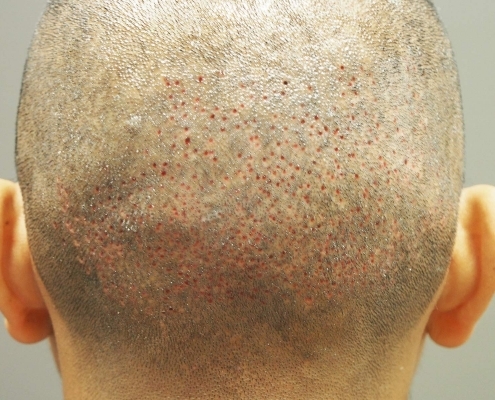 FUE is a widely popular surgical technique used to harvest individual follicular units. The follicular units are excised (removed) by your surgeon with a cylindrical surgical instrument that fits around each hair follicle. The diameter of these instruments typically ranges from 0.8 mm to 1.0 mm and is chosen to fit the size of your hair follicles. The FUE technique can be used for hair transplants, hairline lowering, eyebrow transplants, beard transplants, and scar revisions. 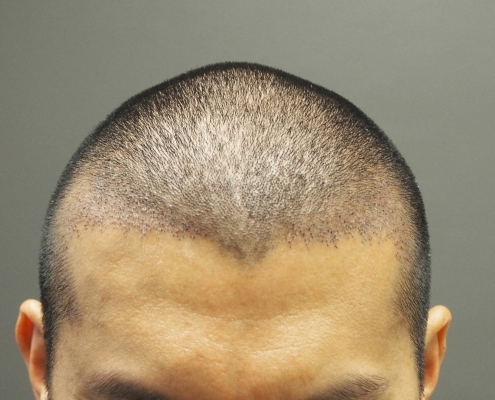 This NHI Medical patient had FUE procedures over a period of four years, totaling 3,191 grafts. Is FUE surgery worth it? If you want to wear your hair very short, FUE is the best harvesting method. A great surgeon will consistently give you great results regardless of the harvesting method (FUE or FUT). One of the advantages for selecting the FUE harvesting method is the after care. Unlike the FUT (Strip) procedure, your donor area can easily be cleaned. The redness in the donor area usually subsides after 5 days, making it nearly undetectable as your hair grows out. The recovery time is also shorter. Will FUE surgery give me the best results? Your results will depend more on how the hairs are placed rather than how the hairs are taken out. FUE is only a harvesting technique. The artistic skill of the surgeon relates to how the hairs are put in (implanted). The technical skill of the surgeon relates to how the hairs are taken out (harvested). The implantation of the hair follicle is the same for both FUE and FUT (Strip) harvesting methods. Your surgeon’s artistic skills are what counts in designing your hairline. Your surgeon will plan out where each hair follicle will be placed in the correct angle, direction, and distribution. This is what translates into what you see in the mirror (your final results). Will the FUE procedure give me scarring after surgery? Is FUE harvesting a scarless surgery? No. FUE will result in scarring and is not a minimally invasive surgery. It is important for you to understand that FUE harvesting is often misrepresented by doctors who promote FUE as a “scarless” surgery, but if you cut or shave your hair short, FUE harvesting of grafts can give you a “moth-eaten” appearance because the hairs that were harvested from your donor area do not grow back. This is a result of overly aggressive surgeons who push the number of grafts harvested. With a rise in mega session FUEs offered by some clinics, there is a new concern for donor area depletion, infection, and worse scarring than a traditional strip surgery. What do I need to know about FUE transection? The transection of a hair follicle is when the end portion of your hair follicle is cut or damaged due to misalignment of the FUE device. FUE harvesting will lead to inevitable graft transection (damage) regardless of how great your surgeon’s skills or technology (e.g. ARTAS). For example, you may end up with less total hairs per 1,000 FUE grafts as compared to 1,000 FUT (Strip) grafts. Many patients will accept a lower yield than they would have received with FUT because they do not have to worry about a linear strip scar when they cut their hair very short. Does this mean the quality of the FUE graft is different than the FUT graft? Yes. FUE grafts look different than FUT (Strip) grafts. FUE grafts are harvested by coring around a hair follicle and bluntly pulling out the graft. This can tear off the bottom tissue and cause some damage. This is not transection. This is just the nature of FUE harvesting. FUT (Strip) grafts are dissected under a microscope. 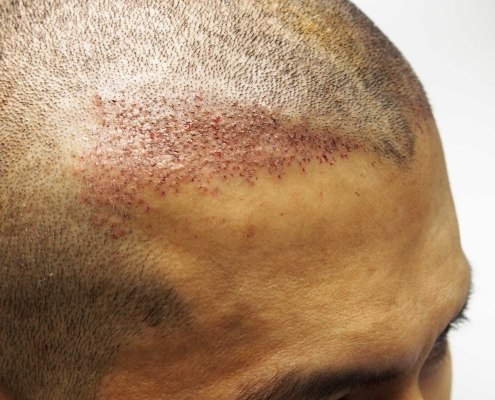 At NHI Medical, your FUE grafts are quality controlled under a microscope, and only FUT equivalent grafts are used. 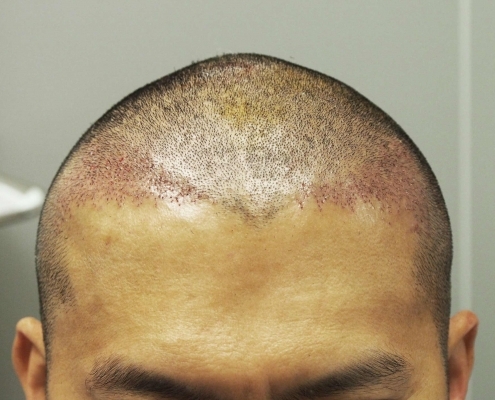 What are patient variables that affect the quality of the FUE grafts? Some patients are more prone to transection of their hair follicles than others. In NHI Medical’s publications, the research shows that the type of prevailing collagen found in the scalp of patients had an impact on their results. Patients with grafts containing more elastin collagen fibers with thinner follicular capsules produced better quality grafts in the FUE harvest process. It is impossible to determine if you would be a great FUE candidate with photos, or just by looking at your scalp. To date, the only way to find out if your FUE grafts are prone to transection is to actually have an FUE surgery. Advances in FUE harvesting technology have minimized transection rates, but the inherent “patient factor” still remains. Is FUE surgery faster than FUT surgery? No, but the differences can be negligible. Reports indicate FUE harvesting rates vary from 100 grafts/hour to as many as 1000+ grafts/hour. 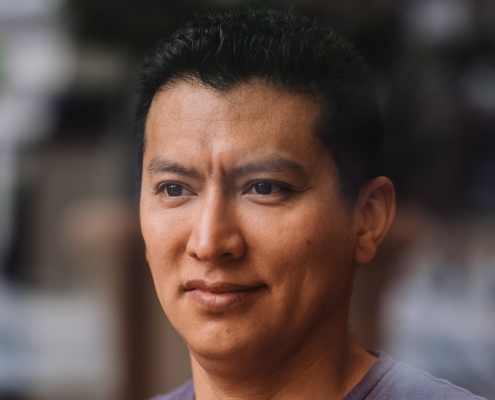 Dr. Pak’s FUE harvest rate can be 1000+ grafts/hour, but he will be the first to tell you that the rate is highly dependent on each individual patient. It is important to note that each doctor or clinic handles FUE grafts differently. Some clinics do not perform quality control. At NHI Medical, we inspect each FUE harvest graft under a microscope and only implant the viable grafts. FUT (Strip) harvesting rates are more consistent and relate to man power. A good surgical assistant can dissect and quality control 300 to 500 grafts/hour. Three to four surgical assistants working as a team can easily surpass your doctor’s FUE harvest rate. This is why it is important to have experienced staff working with your doctor. Do I have to shave my hair before my FUE procedure? Your doctor will have to fit a very tiny 0.8 to 1.0 mm diameter cylindrical instrument into a hair follicle. This cannot be done effectively with long hair, so the back and sides of your head must be shaved. The recipient (transplanted) area does not have to be shaved. Within a week, you will look like you had a short haircut, and your donor area (where the grafts were taken from) should be healed. There are long hair FUE harvesting techniques, in which small sections of hair are shaved so that the longer hairs surrounding the shaved section cover the shaved area. Which instruments are best when performing FUE harvesting? The instruments used for FUE vary considerably among doctors. Many doctors develop their own specialized instruments. All of these instruments have been found to have similar results if the person using them is experienced or trained in that particular instrument. An analogy is that a good chef can always cook a delicious meal no matter what cooking instruments they use. The surgeons at NHI Medical have been performing FUE since 1996. Dr. Rassman and Dr. Pak have invented many of the instruments and innovated the skills used by surgeons all over the world. They hold multiple U.S. patents related to hair transplant procedures, including the ARTAS robotic hair transplant machine. How do doctors get qualified in performing FUE? There is no certification for FUE harvesting. Few doctors have been trained in performing FUE because training is not generally available. When courses were first introduced through the ISHRS (International Society for Hair Restoration Surgery) in 2004, didactic work and workshops were offered to new doctors, but these opportunities are not a substitute to human learning. “Training” for most doctors was essentially a trial and error process. Unfortunately, this does not guarantee that the surgeon has mastered the skills or techniques adequately to produce consistently high quality grafts with minimal hair damage and low transection rates. The success of your surgical procedure will depend mainly on the artistic talent and technical expertise of the doctor and the surgical team. A great doctor with an experienced team can achieve incredible results with a smaller number of grafts than an experienced doctor with inexperienced technicians who promise a larger number of grafts at a bargain price. The experience of your doctor and team will ensure a high percentage of grafts surviving. Hair transplantation involves coordinated teamwork. Who will performing my FUE surgery? In some cases, FUE harvesting is not even performed by doctors. You should always ask your surgeon about their experience and who will be performing which aspects of your surgery. Some clinics offer a discounted rate by outsourcing technicians to harvest your hair follicles. The doctor may not even be involved with your surgery. This should be illegal, and it is a very grey area in the medical laws governing many states. In California, it is illegal for technicians to harvest grafts, but it still happens. 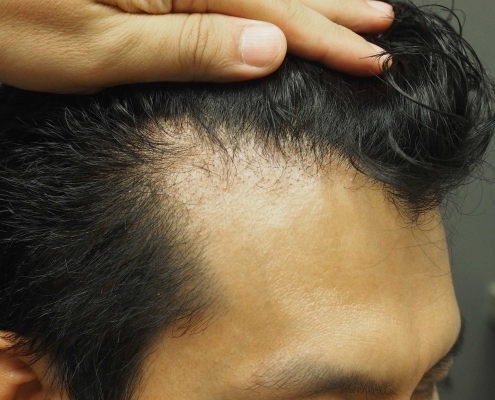 At NHI Medical, your surgeon will be harvesting the FUE grafts.